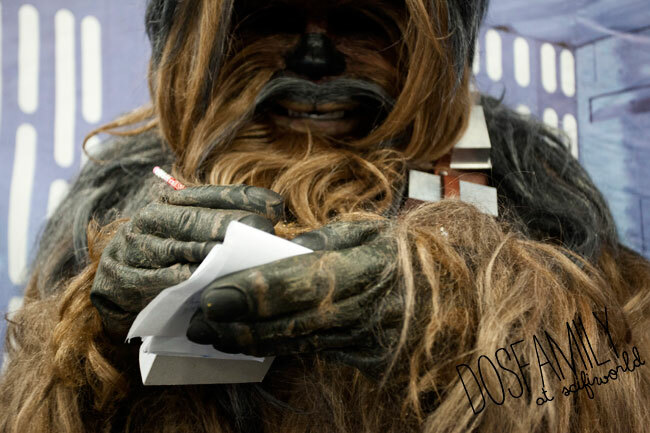 The DosFamily Bear and Viola at SciFiWorld Part2 – Can I have your autograph? The lines were long to get an “real” autograph from stars like Robert Englund and Noah Hathaway but Viola and I were mostly impressed by the people who came to the event as guests in costumes. Viola asked many of these people for an autograph and even though some of them were quite surprised they all signed her note book with “Padmé” , “Obi One Kenobi” and “Chewie” and so on. It worked great as an “ice breaker” and gave us a nice excuse to talk to these people and ask them about their costumes. Well Chewie can´t talk but he patted Viola´s hat and gave her a thumbs up for it. R2-D2 needed some help holding the pen as he moved around “writing”, but his scribbles turned out being Viola´s favorite autograph that day. WHY? I love people who has an obsession. I headed for the annual SciFiWorld in Malmö hoping to find some of them, to take their picture and be inspired by their “let´s go all out” attitude. WHAT? The annual SciFiWorld is a meeting place for scifi-folks and gamers and regular movie buffs. HOW? With the Bear packed in my bag and a autograph note book in Viola´s we drove to Malmö for the SciFiWorld meet up. We hoped for lots of inspiration, some good photo opportunities and a few autographs. I could not fit everything into these two parts, so there will be a Part 3 later this week. haha åh så underbart. skrattade rakt ut när jag såg han som bad viola hålla lasersvärdet. så fantastiskt och såklart att de här hjältarna ska skriva autografer! Åh Chewie. Vilken kul dag! oh how I looooove this! I’m a big Chewbacca fan. Will not miss this event next year. hahah Love you Chewie! kul att du kan skriva på svenska!